Representing the rich Iranian culture in an artistic design isn’t an easy task to accomplish. But many artists from all around the world gathered for the 8th annual Iranian Nowruz, the Iranian new year’s event, and were up for the challenge. For many years, Iranians across the globe have gathered to celebrate the life that blooms with the emergence of spring. Nowruz celebrations, which are funded by the Farhang Foundation, are mainly directed at the promotion of the Iranian art and culture. 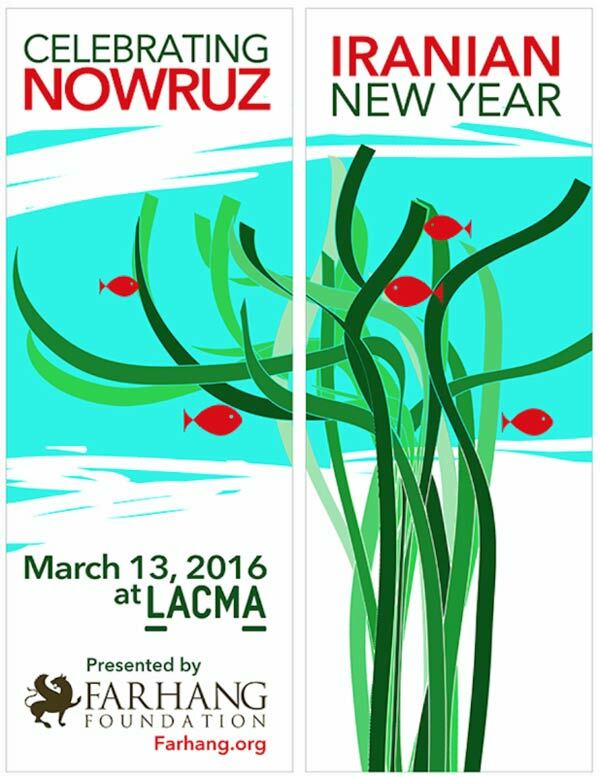 This year Maryam Ghanbarian, an Iranian graphic designer, won the prize for Nowruz street banners. Ghanbarian was born and raised in Tehran. Immersed in a culture that she felt very connected with, she came up with a design that represented the spirit of Nowruz the best. Ghanbarian’s winning design features wheat grass which announces the arrival of the new year, and she added goldfish to the design to represent purity, freshness and vitality. The lively design was displayed on large street banners in Los Angeles. Maryam Ghanbarian has participated in several solo and group exhibitions before and her outstanding work which mixes calligraphy and nature has always attracted spectators. To follow Ghanbarian’s work you can visit her website or her instagram.